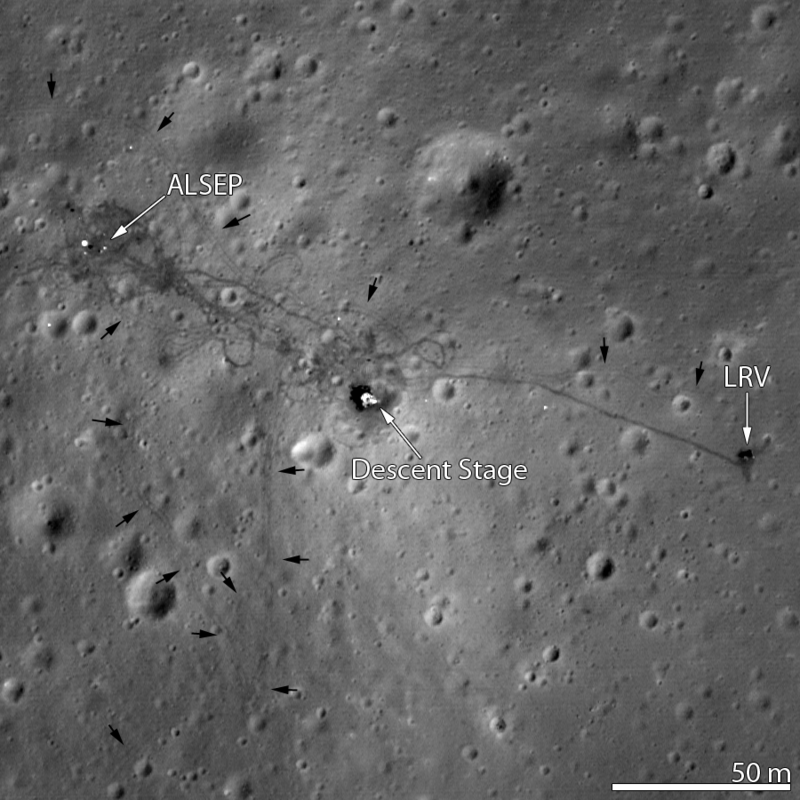 According to Wikipedia there are 3 LRVs sitting on the moon, in very well defined locations. Would China, or whomever gets to the moon with a person next, be able to get in and drive around in an LRV left by the US? Seriously though, while I might not be a space lawyer, there would be nothing wrong in legal terms to borrow and reuse a vehicle abandoned on no man's land. Americans might have been sticking their national flags into the lunar surface, but that wasn't a territorial claim, just a display of national pride for making it there first. Nobody is a legal authority on the Moon, not yet at least, and even if there was someone, would they be able to stop you appropriating by now a defunct vehicle? I don't think so. It would be customary, a polite gesture, to ask their previous owners first. But it most certainly wouldn't be a Grand Theft Auto, even if you didn't. You would need quite a few spare parts on you to make it work, though. It has been mentioned previously that the batteries these LRVs used to run their engines with would have been depleted by now. Partially because of them being used up to a great extent by the Apollo missions themselves, partially because of self-discharging, and partially because of exposure to solar radiation decaying their chemical composition. Either case, they would be utterly out of juice and possibly impossible to recharge. Then, there are the tires. They weren't inflatable, so merely bringing a hand air pump along wouldn't work, and is not merely a matter of the pump not working because there is no real atmosphere to speak of (there is a tiny bit of pressure though due to what we call an exosphere) on the surface of the Moon. So while the tires were made of zinc-coated and woven steel strands, they are still likely in rather poor condition with good 45 years of continuous bombardment of highly charged particles in Coronal Mass Ejections (CME), Solar radiation and the lunar surface regolith electromagnetic discharge. All other parts of LRVs would also likely be in terrible condition, with maybe their aluminum alloy frame, fender extensions and the metallic parts of the seats still in functional order, but the rest would be decayed due to previously mentioned environmental conditions. You would likely need heavier equipment and spare parts to just get them running again, than your brand new vehicle you could bring along would weight. Probably, but you likely wouldn't drive it away. Not only will the batteries be completely discharged, but the rovers have gone through a large number of lunar days since then, creating a large thermal cycle. The number of thermal cycles is on the order of 500 for each one, and the cycles are brutal, going from -150C to as high as 120C each time. Even averaging that out a bit, that's still a 200 degree thermal swing, which will cause problems will all sorts of things. The wheels are composed of a variety of metals. Most metals have a slightly different expansion coefficient, most likely causing them to have expanded/contracted at different rates. No doubt they have some holes in them by now, the best bet would be to just replace them. Similarly, the seats are probably gone. The metal frame is probably mostly intact, but will contain some cracks in it, causing significant losses of structural capacity. No doubt there would be other problems as well. The exact types of problems are difficult to guess ahead of time, but it would require bringing a whole lot of spare parts, for technology from 40 years ago. I'm also not sure, but I would suspect that some of the items, such as the tires, have actually exploded, resulting in some sort of collateral damage to the rover. In addition to the thermal cycles, there are effects caused by the moon itself. While there isn't much of an atmosphere, the dust slowly flies across the moon, meaning that dust most likely covered it. Most likely, there are a few small impacts as well from micrometeorites. And the electronics are probably fried completely as a result of being exposed to high levels of radiation for years. The bearings have probably seized in the wheels, and overall, they are probably in really poor shape. From the images taken of the LRVs from orbit, it appears that they haven't completely fallen apart, but they are darker than I would expect them to be. I can't see the antenna mounted on the rover as is seen in the photograph above. In fact, the rover itself isn't visible, only the shadow. This indicates to me that it is either covered in dust, or most of the interior stuff has fallen off. My personal thought, if you can get to the rovers, take them back to Earth to put in a museum. 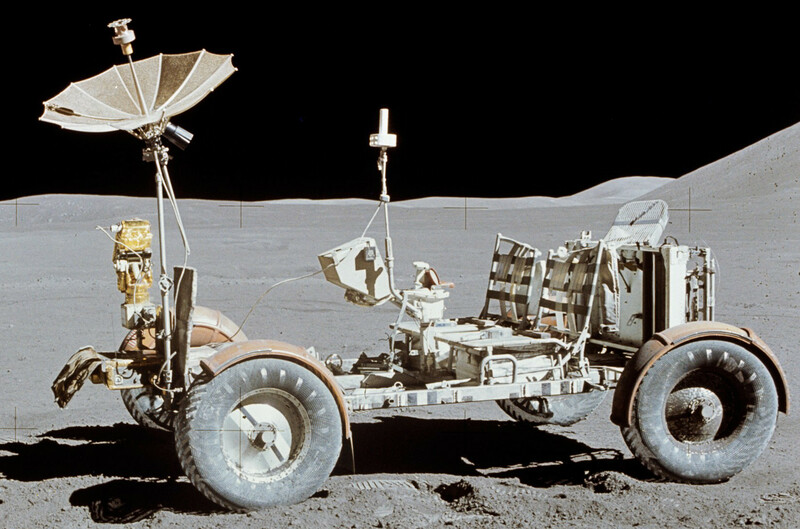 Making one of the lunar rovers work would be more akin to restoring a classic car that hasn't been taken care of at all for years, it would require a lot of time and energy. It seems more suited for a museum. This should fall under similar rules to the Apollo Engines found on the Ocean Bed, NASA wants some say, but the person who finds them has a lot to say about what happens. Just to give you an idea of how well something can survive on the Moon, the Surveyor 3 lander was visited by Apollo 12. Some of the Surveyor landers survived multiple lunar nights, but Surveyor 3 failed to accomplish this task. There is actually an entire paper written on the subject. The results are that everything survived relatively well for the 2 years Surveyor was on the Moon. There was a failure in one of the legs, discoloration, dust contamination, and failure of the electronics, but otherwise the spacecraft appears to be in good overall condition. Thus, I suggest just bringing your own rover. It'll just work better that way. The lunar rovers weren't all that difficult to get to the moon 40 years ago, it shouldn't be all that difficult to make a better replacement for them. First there are the technical issues that have already been nicely covered. There are also political issues, which are more driving than the technical ones. There are treaties, space law, and maritime law to serve as a precedence where space law doesn't exist. 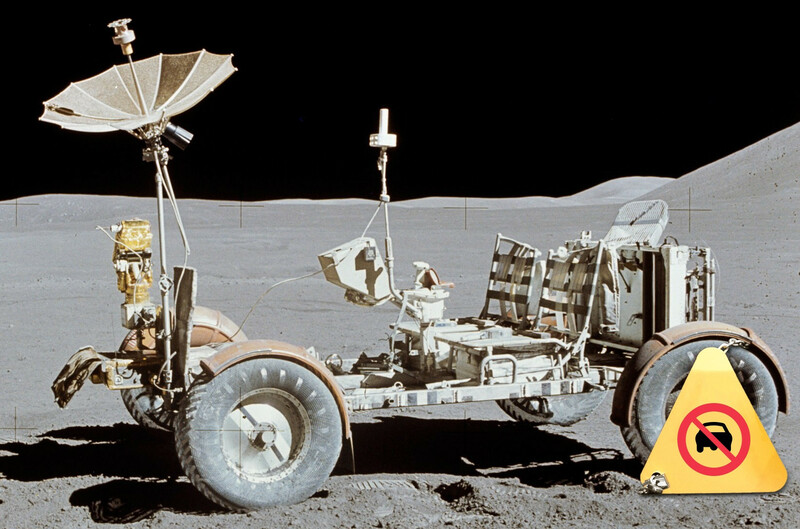 As far as NASA is concerned, those lunar rovers are not abandoned property. To the contrary, NASA has been quite adamant that they are still NASA's property and that they are not abandoned. This has come to the forefront lately with the Google Lunar X Prize. The Lunar X Prize has multimillion bonuses for contestants that go visit one of the legacy lunar landing sites. NASA has issued guidelines with regard to what those contestants could do to help NASA should they go to one of those sites, and also what they absolutely should not do. Space law is about as sparse as space itself. There are however two key provisions that have been signed and ratified by every space faring nation, the 1967 Outer Space Treaty and the 1972 Space Liability Convention. The Outer Space Treaty holds that the Moon and other celestial bodies are the common heritage of mankind. Sovereign nations cannot make claims of property rights on the Moon or any other celestial body. It also addresses non-government entities. The activities of non-governmental entities in outer space requires authorization and continuing supervision by the appropriate state party to the treaty. Finally, Article VIII of the Outer Space Treaty covers objects sent into space, including onto the Moon and other celestial bodies. While states cannot make property claims on celestial bodies, vehicles are still the property of the state, even if apparently abandoned. The Space Liability Convention adds a tiny bit of teeth to some of the vaguer aspects of the Outer Space Treaty. Basically, if something in space isn't yours, you had better not touch it. This raises issues with regard to the growing problem of space debris. Maritime law also comes into play here. With one exception, maritime law has a concept of abandoned ships being salvageable, even if the owner hasn't acknowledged the abandonment. That one exception is ships owned by sovereign nations. Consider the case of Sea Hunt, Incorporated v. The unidentified shipwrecked vessel or vessels, their apparel, tackle, appurtenances,and cargo, and the corresponding countersuit by the Kingdom of Spain. A long, long time ago (1750 and 1802), Spain lost two ships off the coast of Virginia. Sea Hunt, Inc. found them and submitted claims. A lower court found that Spain had never explicitly abandoned the latter ship to sink but had implicitly abandoned the former in the Treaty of Paris. Per this lower court decision, the 250 year old shipwreck was Sea Hunt's to salvage, but the 200 year old shipwreck was still Spain's. The upper court overturned the first decision but affirmed the second. Both ships still belong to Spain. Sea Hunt has no claim. The lunar rovers are powered by two 36-volt silver zinc batteries which cannot be recharged. The lunar rover has a productive life of nearly three lunar days (or it can travel a distance of 92 kilometres). Since it has not been used after its mission, it might have lost its power by now, because of self discharging. The only way is to carry suitable batteries and replace the old one, which is a tedious process. NASA would prefer that you please contact them first. Visitors should not physically contact any USG lunar hardware. Exceptions should be pre-coordinated with NASA. 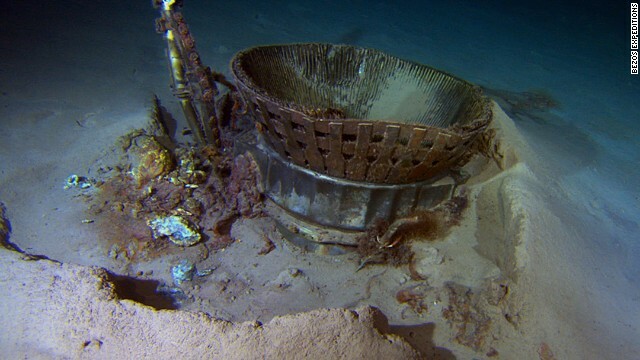 Lunar dust and potential biological contamination may be transferred from the visiting spacecraft onto the historical assets, degrading the historical site and/or impacting the science value of the site. However, physical contact with USG hardware and/or impact debris may provide additional scientific value, which should be balanced with the potential for damage. Coordination with NASA is recommended to ensure acceptance and understanding of all risks and benefits. No, but maybe yes. U.S. President Carter signed treaty's on sharing the Moon, the ocean floors, and a number of other similar things, like Antarctica. They have actually caused plans to utilize resources like manganese nodules to come to a halt due to requirements for sharing resources - at least for the signee countries. Other countries will do as they please. As for the Lunar Rovers, I think they fall in the same category as equipment in Antarctica. If it isn't yours, and it isn't an emergency, don't touch it. But the truth is, the first country to land a gun like a AAA on the Moon is going to own it. A simple automated gun could hit you anywhere in any Lunar orbit. Game over. Who will be first? Not the answer you're looking for? Browse other questions tagged the-moon nasa crewed-spaceflight apollo-program rovers or ask your own question. Would the lunar rovers work (again) today? What would be needed? Is there no physical security in space, other than being in space? Are there international regulations for launching objects into space? Would recovering a lunar vehicle without permission be space piracy? When will humans start to inhabit the moon? What eventually killed the Augustine Commission Report Option 4B, Directly Shuttle-Derived Heavy-Lift Launch Vehicle, a.k.a. DIRECT? Apollo 17, Lunar Roving Vehicle walkback limit “relaxed”? Disc mounted on lunar rover?